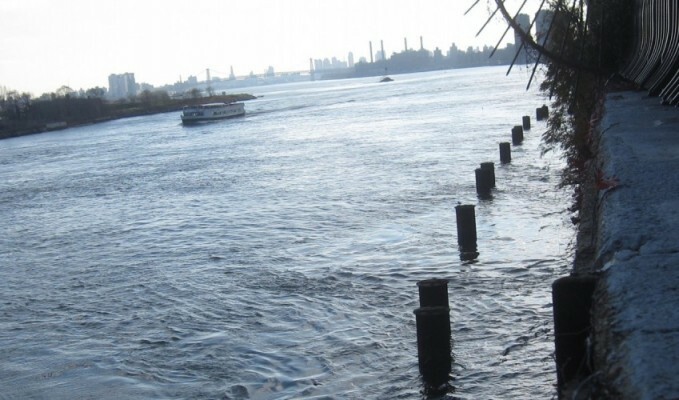 This Thursday evening the Environment & Sanitation and 197a committees of Community Board 8 will be discussing whether to support retaining the caissons from the former FDR Drive Outer Detour Roadway, to be used as part of the project to close the midtown gap in the East River Greenway. Its crucial that we have as many vocal supporters in attendance as possible! It is a slam dunk. CB8 (especially the 197-a Committee) votes for anything the Parks Department wants and the Parks Department wants to sell Robert Moses Playground to built the Greenway. I attended the 7/22/10 Community Board 8 Environmental Committee meeting last night and was the only member to do so. As I expected, it was a slam dunk with unanimous approval by Board Members present. The issue goes up for a Full Board vote in September, and unless a bunch of bicyclists go on a killing spree along the waterfront we can expect total approval there as well. While I totally support the Greenway (bikeway) around Manhattan, it is foolish to not take into consideration the effects on the community and to plan accordingly. I say plan accordingly –not stop the Greenway. The esplanade is very narrow. Once the Greenway goes through, it will become a key (and very popular) transportation alternive. What this means is that many, many people will use it. What this means is that parkland (albeit already abutting a major highway –the FDR) will turn into bicycle roadway. To suggest otherwise is to ignore reality. To sell a park like Robert Moses Playground –a rare inland park in CB6 — for a thin strip of paved waterfront is not an even exchange. Anyone who has spent time on the East River waterfront esplanade can tell you that it is broiling hot all day long and largely shadeless. Not only that but it is right on the highway and soon to be between a highway and a bikeway. Robert Moses Park is a real park. It should be preserved, not exhanged for the Greenway. Thank you. Here is some new relevant terminology that I found while googling to find out why a bicyle roadway was being called a Greenway. A greenway is a long, narrow piece of land, often used for recreation and pedestrian and bicycle traffic and sometimes retail uses. A foreshoreway is a public right of way along the edge of a water body. The terminology was derived to avoid the perception of a pavement favoring either pedestrians (walkway) or cyclists (bikeway). Foreshoreway is often defined as the paved route pathway accessible to public pedestrians that is closest to the waterline and offers the opportunity to move along the water body. Greenways and foreshoreways are NOT parks although some may argue that they are a newfangled park / roadway hybrid. This bolsters my opinion. Do not exchange parks for foreshoreways. They are apples and oranges.